This picture is from an original oil painting by present day artist Terry Grace. It illustrates how the artist imagines Stonehenge would have looked during the 1914 – 1918 war. 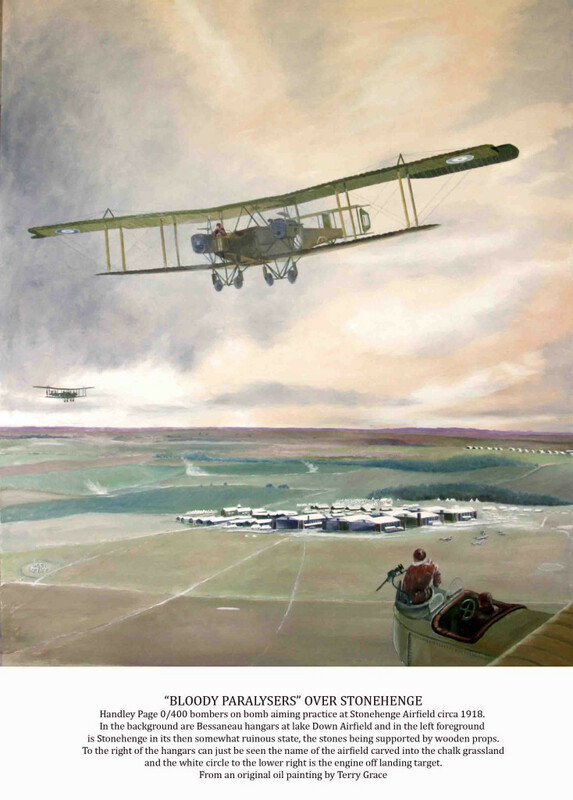 It depicts Handley page bombers on bomb aiming practice over Stonehenge aerodrome circa 1918. In the background are the Bessaneau hangars at Lake Down Airfield, and in the foreground to the left are the stones of Stonehenge. Stonehenge Airfield was opened as a Training Depot Station in 1917 to help ensure the steady, continuous supply of trained pilots for the war effort.